At the intersection of two major U.S. highways (I-70 and I-71), Columbus’ central location is within a day’s drive of half of the nation’s population. John Glenn Columbus International Airport is only 10 minutes from downtown Columbus and offers 36 non-stop destinations by all major airlines, including (in order of the most flights) American, Southwest, Delta, United, Air Canada and Frontier and the recently added non-stop Southwest flight to the San Francisco Bay area. 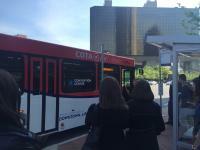 AirConnect, a new circulator route to/from the Columbus International Airport and downtown Columbus, is now available. The cost is $2.75 each way. Stops will be made at the arrival and departure levels every 30 minutes, 7 days a week. In downtown, stops will be made at the Greater Columbus Convention Center and many of the downtown hotels. Tickets can be purchased at a kiosk with credit cards (only) and tickets can be purchased on-board with cash (only). For additional information, visit COTA.com. Taxis and Uber drivers are easily accessible and, for those looking to get a little exercise, the CoGo bike share program offers 300 bikes in downtown Columbus with 30 stations, including a station on High Street, right in front of the convention center. The CBUS, a free downtown circulator makes it easy to get around from the Short North Arts District to the Brewery District.